Former MIC vice-president SS Subramaniam has today joined PKR, making him the most senior MIC leader to defect to the opposition. At a function held in Petaling Jaya City Council this afternoon, the 72-year-old politician also announced that 12 MIC branches in Petaling Jaya would fold and join PKR en masse. He claimed that the closing down of these branches would result in a mass defection of about 2,500 MIC members to PKR. “I have been supporting PKR and its de facto leader Anwar Ibrahim’s policies for a long time, but it’s only now that I have the guts to say that I am joining the party,” he told a cheering crowd of about 350. “I know that my defection will come under heavy fire from (MIC president S) Samy Vellu, but I think all current BN policies are going backward 20 years and they only benefit certain people. “What I want is for the people to move forward to further development and I believe PKR will lead me to that dream,” said Subramaniam, who is also MIC Taman Perangsang branch chairperson. He said he would dissolved his branch once he resigns as MIC member next week. Subramaniam (seated, second from right) has once served as MIC vice-president and is former Bukit Raja assemblyperson and a one-term parliamentarian for Segamat, Johor. He is also former parliamentary secretary for the Ministry of Trade and Industry. His defection to PKR came exactly a week after former health minister and prominent MCA leader Chua Jui Meng threw his lot with the opposition party. Subramaniam’s announcement to defect was warmly welcomed by Anwar and other top PKR leaders. Subramaniam’s brother, 59-year-old Dr SS Streram, who is a MIC branch leader in Seri Sentosa, will also be joining PKR. Earlier at the function, MIC Pekan Meru branch leader AR Palaya told the crowd that he too was dissolving his branch. Besides Taman Perangsang and Seri Sentosa, the other MIC branches that are expected to defect are Section 14 Utara, Taman Medan, Kampung Pinang Tunggal, Kampung Perangsana, Kampung Baiduri, Taman Medan Baru, Petaling Baru, PJS4, Jalan Templer and Impian Baiduri. 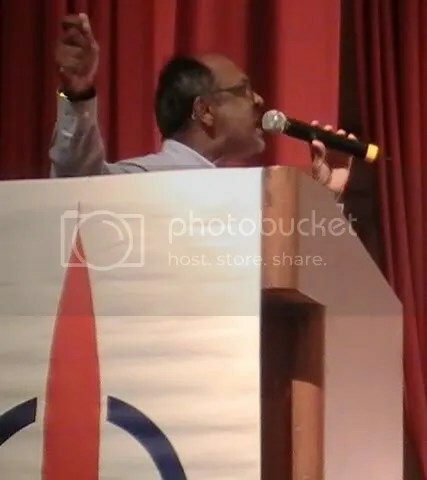 In his speech, Subramaniam took the opportunity to lash out against his former boss for causing divisions among Indian Malaysians. “Samy Vellu has caused so much damage to the Indian community. When he first became the party leader, he used to ask, ‘What race is this, what race is that’? If that person belonged to the same race as him, only then he would lend a hand,” said Subramaniam. However, he is confident that multiracial parties such as PKR will “fight for the rights of all races”. Speaking to reporters later, Subramaniam said one of the reasons which prompted him to defect was the government’s flip-flop policy on the teaching Mathematics and Science in English (PPSMI). Subramaniam added that he does not expect any high position in PKR as he said he was joining the party for the “betterment of the country”. “As you grow older, I figured, let’s do something to change the world. You don’t know what is going to happen tomorrow,” he said. Earlier, PKR supremo Anwar described the defection of Subramaniam and other MIC leaders as a major boost for the party from the Indian Malaysian community. “I’ve been receiving good news since last week. First, Jui Meng joined us and the MCA ship is already sinking because of it. “Now together as one big Malaysian family, we should fight for the rights of every race in this country,” he said. Meanwhile Subramaniam’s defection today has caused some ‘trouble’ for the other S Subramaniam – the former deputy president who is challenging incumbent G Palanivel in the coming party polls. His aides informed Malaysiakini that this Subramaniam – Samy Vellu’s arch rival – has been getting phone calls from his supporters to inquire about his sudden decision to ‘defect’. At the same time, news from Samy Vellu’s camp indicated that they were happy – albeit wrongly – that their boss’ nemesis had finally gone, leaving the path clear for Palanivel to retain his post. Significantly Palanivel won the post in the last party polls by defeating this Subramaniam. “My boss is still with MIC and he will continue to fight to reform the party,” said Subramaniam-loyalist KP Samy. For the record, there is another S Subramaniam in MIC – a medical doctor who is the party secretary-general and the sole representative in the cabinet. He is also the present MP for Segamat, a post held by the other two too in the past. Party sources are also not too concerned about the defected Subramaniam, calling him a “retired politician”. Internationally acclaimed film director Yasmin Ahmad is currently warded in intensive care after collapsing from an unknown ailment. A check with the Damansara Specialist Hospital revealed that she is warded at the Intensive Care Unit though no official confirmation about her condition could be obtained at the time of writing. Her brother-in-law Dr Zakaria Zahari was quoted by Bernama as saying that Yasmin suffered a stroke and haemorrhaging in the brain. “Her heart is being supported by drugs to control blood pressure…the next few hours are extremely important but now she is stable even though she is still unconscious,” he said. The hospital has yet to issue a statement on her condition. She is said to be in stable condition and is on life support after undergoing emergency surgery. A host of anxious celebrities and people from the film industry were reported to be at the hospital. Media Prima Sdn Bhd sources said Yasmin collapsed during a meeting at the company’s headquarters at Seri Pentas in Bandar Utama, Selangor. Also present at the meeting was multi-platinum selling singer Siti Nurhaliza and her husband Khalid Jiwa. Siti said Yasmin was presenting a paper and had complained of not feeling well 15 minutes into her presentation. 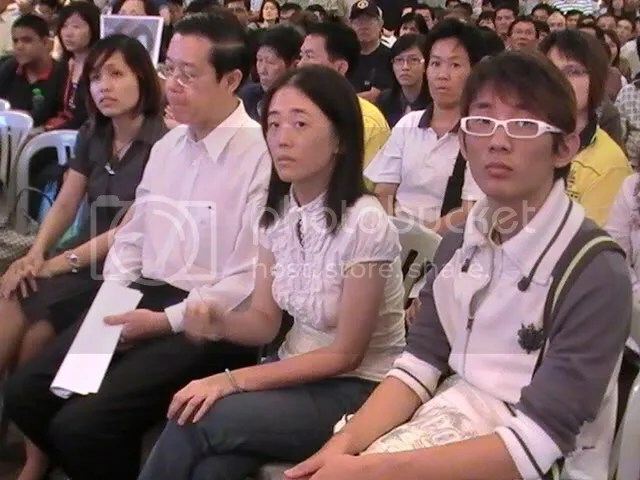 “She had started the presentation at 3pm and when she did not feel so good sat down and placed her head on a table. “A few seconds later, we tried to wake her when we found she was having difficulty breathing,” she told reporters at the hospital. Sources said Siti, the Malaysian Red Crescent Ambassador, performed CPR on Yasmin before an ambulance arrived. Yasmin, 51, is best known for her feature film Sepet and her long list of community message television commercials for national fuel giant Petronas. The incident in Seri Pentas has sparked a flurry of reactions on micro-blogging site Twitter.com, with many expressing deep concern. “Prayers for Yasmin Ahmad, a wonderful person wt great ideas. Pls do wake up, Malaysia hasn’t seen the best of u yet”, wrote one commentator erinadlina. “Sad to hear about Yasmin Ahmad. This is one of my fav ad she did for Malaysia National Day”, wrote RippingYan. Initially, speculation by Twitter users was that Yasmin had passed away, but as news got around corrections were posted and many users urged the public not to spread rumours. The sheer volume of posts with the words Yasmin Ahmad has propelled her name to the top the list of Twitter’s top-10 trending topics, beating Michael Jackson and Tim Burton s Alive in Wonderland . Some Twitter users have commented that this may be the first time a Malaysian has made it onto the top-10 list. Others said this signified the vast popularity of Yasmin Ahmad and the large volume of Twitter users in Malaysia. kerana sudah pun memerintah Malaysia. Apapun, tahniah kerana telah menjejaki langkah Wanita KEADILAN yang terdahulu. Parti Keadilan Rakyat melahirkan rasa kecewa dengan pendedahan laporan bahawa Menteri Pertahanan Datuk Seri Ahmad Zahid Hamidi telah mengadakan pertemuan dengan rakan sejawatnya dari Israel, Ehud Barak di Paris bulan lepas. Turut dilaporkan ialah Zahid telah terlebih dahulu mengakui menemui Perdana Menteri Israel Benjamin Netanyahu, dan bahawa beliau (Zahid) telah berkeras supaya tidak ada jurugambar yang hadir dalam pertemuan tersebut. Walaupun langkah berjaga-jaga telah diambil bagi memastikan pertemuan tersebut kekal menjadi rahsia, jelaslah sekarang bahawa apa yang berlaku di Paris, tidak semestinya hanya kekal di Paris! Pertemuan yang sedemikian rupa dengan regim yang telah dikecam di seluruh dunia kerana kekejamannya di Palestin dan Lebanon secara tidak langsung menunjukkan ketidakpekaan dalam isu moral dan politik, tidak kira apa jua justifikasi yang diberikan oleh Zahid. Sesungguhnya, adalah amat menyedihkan sekiranya Zahid berasakan bahawa pertemuannya dengan Israel akan membuatkan Israel mengubah caranya, sedangkan sekutu-sekutunya yang paling setia seperti Kesatuan Eropah dan Amerika Syarikat pun tidak berjaya dalam desakan supaya regim Zionis mengubah caranya, contohnya desakan untuk menghentikan pembinaan pendudukan haram Yahudi di atas tanah Palestin. Oleh itu, kita hanya dapat membuat kesimpulan bahawa terdapat lebih daripada sekadar pertemuan yang biasa dalam gerak isyarat diplomatik singkat Zahid dengan Menteri Pertahanan Israel, yang merupakan orang yang sama yang bertanggungjawab dalam semua serangan udara yang dikecam hebat oleh kerajaan Malaysia selama ini. Pertemuan ini menimbulkan persoalan tentang keupayaan Zahid dalam membuat penilaian yang baik dalam tempoh yang singkat sejak dilantik sebagai Menteri Pertahanan. Apakah urusan Malaysia untuk bertemu dengan Menteri Pertahanan sebuah regim yang mana ia tidak mempunyai hubungan, atau yang tidak pernah diakui hubungannya? Bagi menambahkan lagi keraguan, pertemuan tersebut bukannya di antara dua orang menteri luar negeri, tetapi di antara dua orang menteri pertahanan. Protokol politik tidak akan membolehkan dua orang Menteri Pertahanan kerajaan-kerajaan yang tidak mempunyai hubungan diplomatik untuk mengadakan pertemuan. Jelaslah Zahid telah melangkaui deskripsi kerjanya. More than 2,000 people gathered for the funeral of Teoh Beng Hock in Alor Gajah, Malacca. During the funeral rites, which began at 9.45am, Teoh’s pregnant fiancee Soh Sher Wei (right) read out a moving tribute. She called on Teoh to “come back”. Many were in tears as they listened to her. Seputeh MP Teresa Kok represented DAP as she read out the party’s condolences. 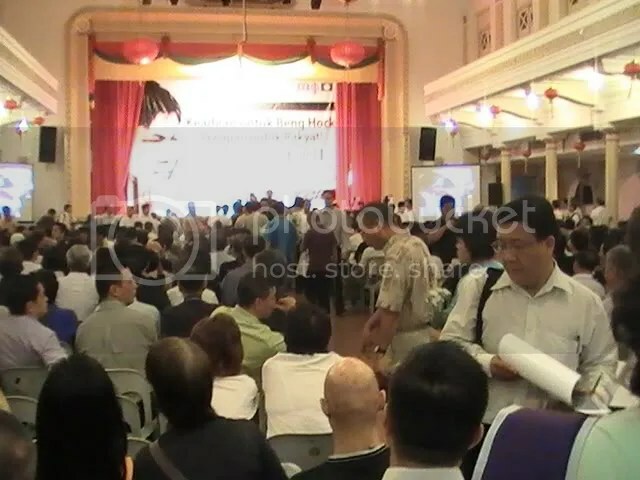 Among those present were representatives of several Chinese guilds and associations, and members of Pakatan Rakyat. The funeral procession began at 10.45am. The crowd accompanied the hearse, which was decorated with red trimmings to signifiy sudden death. Family members and Pakatan leaders and supporters followed the cortege on foot for about 1km from the house to the main road. Many were crying openly. His sisters murmured “rest in peace”. 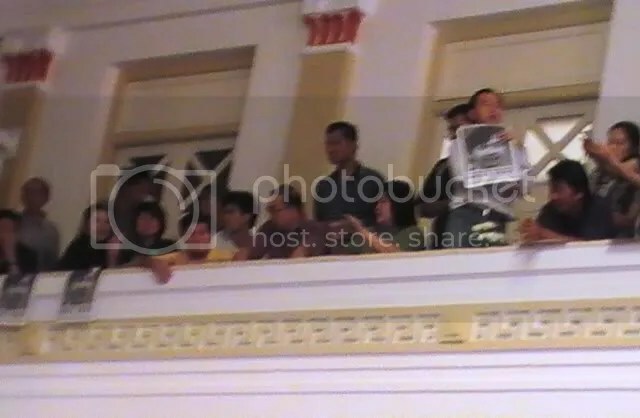 Black-and-white A4 posters with Teoh’s photograph were held up by many in the crowd, displaying the words jangan biarkan Beng Hock mati sia-sia (don’t let Beng Hock’s death be in vain). A huge black-and-white poster, prepared by PKR, was carried in front of the hearse. 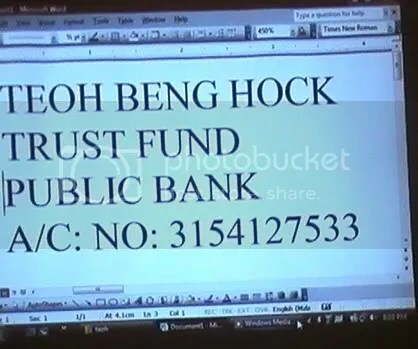 It bore the words ‘Justice for Beng Hock’. Other banners had wordings in Chinese that read ‘Justice for Beng Hock’ and ‘The people want answers’. At 11.05am, the procession ended and many transferred to vehicles for the rest of the journey to the Nirvana Memorial Park in Semenyih, where the burial will be held. The convoy arrived in Semenyih town at 12.50pm, where people were waiting with banners and flowers. It reached the memorial park 10 minutes later where 500 supporters had gathered. Teoh’s body, now in a temple in the cemetery, will be laid to rest at the selected auspicious time. Earlier today, some 500 people had gathered at Teoh’s house by 9am. The atmosphere was one of silent outrage, with dozens of banners being displayed outside the premises. These bore messages ranging from ‘Don’t let Beng Hock die in vain’, ‘ Justice for Beng Hock, answers for rakyat’, ‘ Set up royal commission (of inquiry), let justice be served’. It is learnt that the family had requested a low-key reaction from mourners and that the crowd had complied by not shouting slogans. All the main Pakatan leaders paid their last respects at 10.18am. They were joined by former MCA vice-president Chua Jui Meng, who had only joined PKR last Saturday. They were followed by Malacca MCA exco member Gan Tian Loo. About 10 police personnel, including traffic police, monitored the situation and directed traffic. DAP leaders led by Lim Kit Siang, Karpal Singh and Guan Eng held a press conference about 9.30am. Kit Siang said he wants premier Najib Abdul Razak to announce that a royal panel will be set up immediately on his return to Malaysia today, rather than wait until the weekly Cabinet meeting on Wednesday to make a decision. He also urged Najib to order the MACC to “stop the war against Pakatan”, adding that the anti-graft body has “become Umno’s tool to topple the Selangor government”. Karpal said he wants Najib to suspend Ahmad Said as MACC chief. PKR de facto leader Anwar Ibrahim also spoke briefly to the press, calling for stringent action. He said the government must not dilly-dally and that both the police and anti-corruption heads have to assume responsibility for the situation “because the questioning of Teoh broke some rules”. Pakatan leaders will meet in the shortest time to discuss the issue, he added. PAS vice-president Salahuddin Ayub backed calls for a royal commission of inquiry, saying Malaysians should be told what had happened to Teoh. 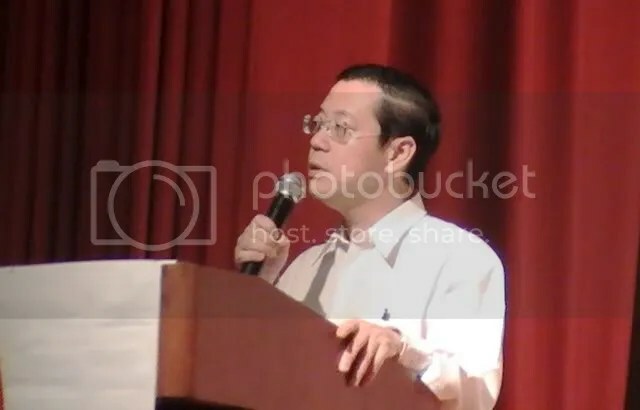 DAP secretary-general Lim Guan Eng said: “We want to tell Beng Hock that he will not be forgotten. We also want to tell the Malaysian Anti-Corruption Commission (MACC) that we will not let them off (the hook)”. He had been picked up on Thursday about 5pm for questioning by the Selangor MACC in relation to a proble into the spending of constituency funds. His body was found about 1.30pm the next day on the fifth floor balcony of the building in which the MACC is housed in Shah Alam.